Box Tops for Education is a fundraising program by General Mills. School supporters can earn cash for Douglas by buying groceries, shopping online, and buying books to earn Box Tops. 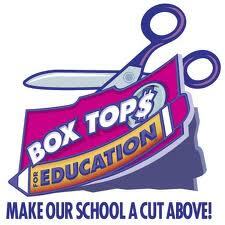 We earn more than $1000 each year through the Box Tops program. Clip Box Tops from hundreds of favorite products and drop them in the collection center in the school lobby (outside the office, under the signin/signout shelf). There is also a receptacle near the checkout at Roche Bros. Box Tops Marketplace: Register and pick a password on the Box Tops website, and shop online. Earn eBoxTops that will be deposited directly to our school account, and we can earn up to 15% of purchases. Most retailers offer free shipping or ship to store. This is a great time saver especially around the holidays. Bonus Box Tops: You can enter the Box Tops Sweepstakes for chances to win hundreds of bonus Box Tops for Douglas. We submit Box Tops twice during the year: November and March. You can turn in labels and Box Tops anytime, but we try to get as many as possible during these deadlines as Box Tops issues checks twice a year. This is cash for the school to use! For a complete list of products, go to the Box Tops website. You will also find recipes and coupons for up to $1.00 off products you probably use everyday. ESR earned more than $2,300 last year. Look for contests coming home throughout the school year. Total earnings since the program started in 2002: more than $23,994.03. Here’s a list of participating products.